My guests practically licked the bowl clean and there may have been some arguing over who got the last scoop. Another sure sign that the recipe was a success: Some of the guests sent tweets or posted on Facebook the next day that they wished they could have some more! Sometimes I like to add a clove or two of garlic to this recipe to make it a little more savory. You can also split the batch in half and put garlic in one portion and none in the other to decide which you like better. Whichever way you choose, I’m sure you’ll fall in love with this fruity guacamole recipe. As with most guacamole recipes, this one is vegetarian and vegan-friendly, and gluten-free too. 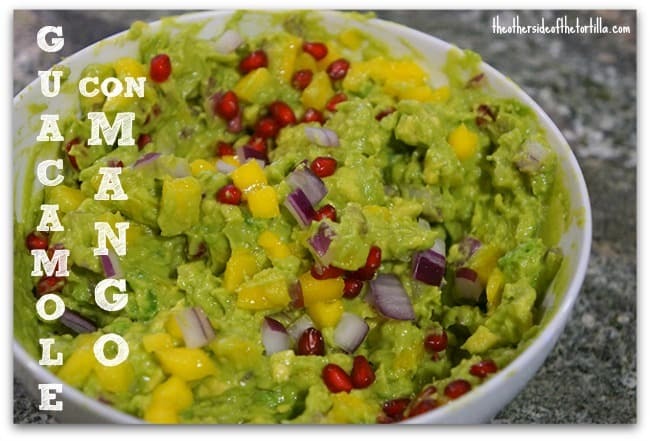 Give guacamole a fruity twist with mango and pomegranate. Cut open the avocados, discard the pits and spoon into a large bowl. Squeeze the lime juice over the avocado, sprinkle the kosher salt over the top and mash coarsely with a fork. Add the diced mango, red onion and serrano chile and stir to mix well. Gently fold in the pomegranate seeds so as not to break them. Serve chilled and with the tortilla chips of your choice. Serve chilled. Can be made a day ahead of time. Here are my instructions how to keep guacamole fresh and green if you aren't going to serve it immediately. 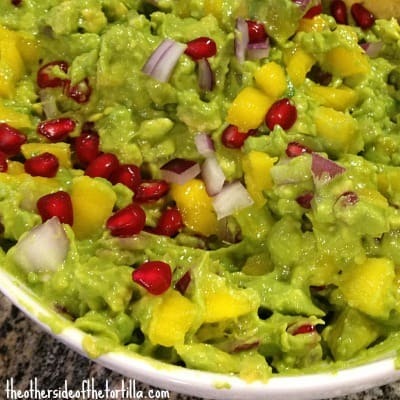 What kind of fruit do you like to add to your guacamole?